Mapping Molecules in Central Nervous System (CNS) using Mass Spectrometry Imaging (MSI): Pharmacokinetics & Pharmacodynamics Applications. Does the drug candidate reach amyloid plaques or does a repeat dose of drug candidate decrease the amyloid plaques formation? Is my drug candidate molecule reaching specific region of the brain and what are the drug and metabolite concentrations at different time points? technique. In preclinical drug development, MSI provides pharmacokinetics and pharmacodynamics information about a drug targeting specific anatomical regions of the brain using high definition images. Animal: Brain from transgenic mouse model (Tg2576, 7 months) was removed; snap frozen and stored at -80°C. Sectionning: Brain was sectioned following the coronal plan (10 microns) using Microm HM560 cryostat (Thermo Scientific, Germany) at -20°C and mounted on ITO conductive glass slides (Bruker Daltonik, Germany). Prior to analyzes, washing step protocol  was applied on tissue section to increase detection of peptides. HE Staining was performed after MSI acquisition for better visualization of histological regions and amyloid plaques. deposited manually using TLC sprayer (Sigma, France). Germany) with SmartBeam II laser. Full scan Positive mode (800-6000 Da) at 100 μm spatial resolution. 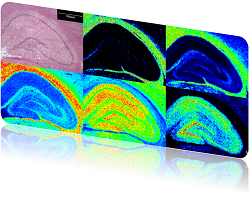 Software: FlexImaging 3.0 (Bruker Daltonik, Germany) & Quantinetix 1.4 (ImaBiotech, France). of a drug targeted specific Alzheimer’s disease regions in the brain. mass spectra and followed on molecular images from figure 1. A! capacity of FTICR mass spectrometer. Mass measurement accuracy was calculated at low ppm level (between 0.4 & 3.8) on 5Abéta forms and reported in table from figure 1.
hunting and capacity of drug distribution with biomarkers of efficacy. were removed, snap frozen and stored at -80°C. -20°C and mounted on ITO conductive glass slides (Bruker Daltonik, Germany). Washing of sections with chloroform was performed (30 seconds) for better visualization of histological regions. deposited using SunCollect device (Sunchrom, Germany). TEC Determination & Calibration: Dilution range of drug between 0.02 – 10 μM, 1 μL of standards deposited near dosed section on the slide. Drug concentration for TEC experiment was set at 10 μM and deposited on control section. TEC was calculated according methodology from Hamm et al . Germany) with SmartBeam II laser. Positive CASI mode (50 Da Window) at 80 μm spatial resolution. The second MSI application is focused on a candidate drug against Alzheimer’s disease targeting specific regions of the brain. This study is closely related to the previous example (n°1) on Amyloid beta peptides localization; in fact, it is possible to evaluate the action of a drug on its environment or on potential disease state biomarkers such as A#s. Thereby MSI may play a significant role in understanding ‘target engagement’ in early phases of drug discovery. This example deals with a sponsor candidate drug study, which is still under development and therefore requires confidentiality. The candidate drug shows a specific distribution in the hippocampus, the 3rd and 4th ventricles, the septum, the plexus choroid and in the medio-ventral hypothalamus. The drug identification was validated by on tissue mass spectrometric fragmentation experiment (MS2) highlighted attended mass fragments detection. These histological regions of the brain could be involved in Alzheimer’s disease development and consequently could demonstrate the efficiency of drug targeting in CNS. hypothalamus, which closely co-localized with its parent compound. parent drug and its metabolite. Mass spectrometry imaging: Autoflex Speed LRF MALDI-TOF (Bruker, Daltonik, Germany) with SmartBeam II Laser. Positive mode at 150/300 or 20 μm spatial resolution. achieving a thin matrix layer (1micron of thickness) with small matrix crystals (less than 1 μm of diameter). These parameters induce a minimized analyte spreading within tissue and combining with high focused laser, creates a high spatial resolution mass spectrometric images. presented at low spatial resolution, 150 and 300 microns respectively, in figure 3. Some contrast ionic species are used to differentiate simply large histological structures of the brain. From one hand, white (green filter) and grey (red filter) matters are easily discriminated on overlay molecular image from coronal section. From the other hand, cerebellum region is well localized from the rest of the sagittal brain section (red filter). Low spatial resolution images allow observing only large histological regions while high spatial resolution can give higher level of interpretation. questions The combination candidate drug, metabolites and disease state biomarker (A!) study demonstrates the type of reliable information provided by MSI. Moreover, biological processes can be assessed directly on tissue sections, such as the formation of amyloid plaques correlated with Amyloid beta peptides detection. Quantitative measurement of the drug candidate in small histological regions using MSI prevents the challenging and time consuming dissection steps. Finally, high resolution molecular imaging allows following molecules at the cellular level such as neurons or other cells, which could be related to some specific brain diseases.